Teach Your Giraffe to Ski. Although the chalet is cozy, nothing will deter Giraffe from donning skis and gliding with ease. A cautious child protagonist sticks close by, offering emotional support and practical advice to the novice skier. Elbee adeptly mixes humor with tips on safety, etiquette and introductory ski technique. Giraffe grins through the typical goofs and gaffes associated with learning something new. Eager and fearless, Giraffe’s enthusiasm is tempered by the child’s caution and protective concern. Once she’s mastered the basics, they head to The Big Scary Slope! Readers will cling to the edge of their lift seats anticipating a slick, speedy, swerving conclusion to this snowy, sporting tale. Gowdy’s cartoon-like illustrations are bright and colorful, incorporating a playful menagerie of unlikely skiers. The gleeful expressions of Giraffe and timid trepidation of the child are counterbalanced between spots and full page spreads. Slipping, sliding and gliding are conveyed via whipping scarf tails, swerving ski trails and exuberant snowy splatters. 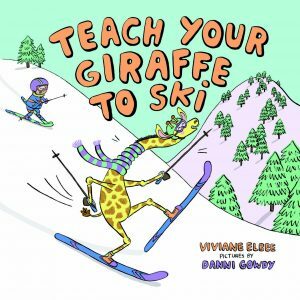 Whether you are bunny slope bound, black diamond material, or even a lodge loafer, Teach Your Giraffe to Ski is tons of fun. 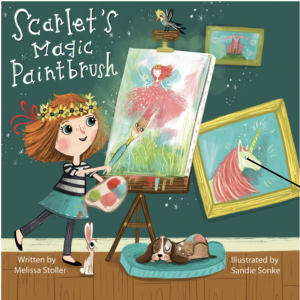 Creative determination also threads through Scarlet’s Magic Paintbrush, the story of a young artist who learns to appreciate the power of a hands-on, personal touch. 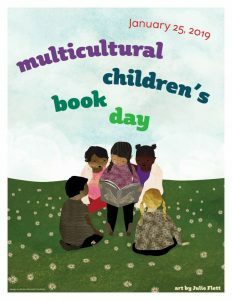 This is a sweet debut book from author Melissa Stoller and illustrator Sandie Sonke. Scarlet finds a magic paintbrush that does her bidding, creating fairies, unicorns and princesses that are perfect masterpieces. But losing the magic brush creates a dilemma for Scarlet. After she searches high and low for the magic brush, she tries painting with regular, non-magical brushes. While the results disappoint her, she doesn’t give up. In a clever twist, Stoller makes her protagonist get creative; painting with her left hand, trying a homemade brush and even using her fingers. Sonke fills the pages with soft blue clouds and sparkling stars, framing Scarlet and her range of canvases with colorful detail. 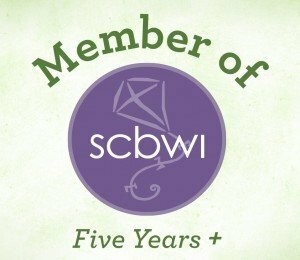 The magic paintbrush has emotional, animated expressions, and observant readers will enjoy following a faithful pooch that trails Scarlet throughout her artistic quest. Scarlet’s Magic Paintbrush is an open invitation for young artists to explore ideas of perfection and frustration when it comes to mastering technique and finding a personal style. The magical paintbrush element will appeal to many, while the celebration of self-expression and creativity ultimately shine as the most important aspect of original work. A perfect book to pair with paint and canvas for budding artists! 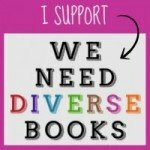 Find another recent Epic18 debut review here.